Only a very quick posting this evening, it's been a busy weekend making the most of the dry weather and spending some much needed time in the garden and greenhouse. In the last week I've potted on the tomatoes, peppers and chillies, then today I've potted on all the herbs, and started the runner beans and french beans (they are presently tucked up snugly in the greenhouse). The sweetcorn have been started too and have taken up residence in the conservatory. We have so much waiting to go into the allotment but we're unable to plant out because it's still so wet and boggy up there, that the plants are liable to die off due to the ground being so wet and cold. My old Nan used to say that the weather always changed for the worse whenever the Russians or Americans used to send another rocket up into space in the late 1960's and 70's so as the Koreans recently tried to send one up and it failed I am now blaming this late spell of cold and wet weather on the Koreans!! !.......Blooming rockets!! Your garden looks lovely. We've got masses of stuff waiting to go in the ground at the allotment too. J managed to get some more potatoes and onions in yesterday and some more broad beans - our first lot were decimated by slugs, whereas usually they don't get touched.Some people have planted out French and runner beans and they've been hit by frost and cold winds. Even though we feel like we're behind it's better to hang back for a while longer. 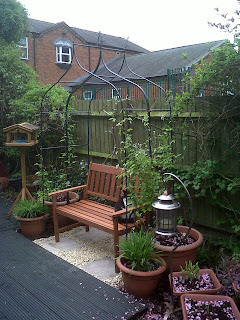 If you wake up one morning and find your pretty garden seat and arbour missing....check by my pond! !